Happy Thanksgiving! It’s the time of the year that we remember to that God for our blessings and show appreciation for the people in our lives. At Sunday school a couple weeks ago, we had the kids list things that they are thankful for an leaves and glue them to a paper tree. They listed their parents, their friends, their things and their favorite TV shows. I’m thankful for those things, too, especially the friends and family! I find myself thanking God for them every day. It is easy to be thankful for the good things in my life. What is less easy is being thankful for the frustrating things! The Apostle Paul wrote in 1 Thessalonians 5:18. “…Be thankful in all circumstances, for this is the will of God in Jesus Christ for you.” Many of us spend a lot of time trying to find out the will of God for our lives so that we can follow it. Yet here is a clear explanation of His will for us, and we often completely forget to do it! Being thankful in all circumstances means thanking God for the good things in our life, but also thanking Him for the stuff that bothers or hurts us. My challenge to you this Thanksgiving is to list five to ten frustrating things you are thankful for and why. I am thankful for expensive food prices because it encourages me to learn to make things like mayonnaise, bread, and tortillas. I am thankful for Mosquitos because even though they are annoying, they aren’t scorpions! I am thankful for med school keeping Ben busy because it makes us value the time we do have together and helps us to make the most of it. Enjoy your holiday! Let’s finish off the year with thankful hearts every day. Love where you live. No matter where you live, learn to love it. When I was a kid, we moved from Flagstaff to Phoenix, and I spent a lot of time wishing we were back in Flagstaff, in the country, in the mountains. It took me a long time to learn to love where I lived. Too long. When I finally decided to stop looking North and start looking around me, do you know what I learned? Glendale is considered the best US city for taking walks. Greenbelts, winding paths to duck ponds and play grounds– that is hard to beat. I learned that Phoenix is one of the most diverse cities in the States with a great number of different people groups, many refugee communities, and immigrants from around the world. This means wonderful opportunities to meet people with interesting stories, valuable insights, and the smorgasbord of worldviews and experiences. You can attend a church in any language. You can shop at a supermarket specially designed to reflect the tastes of any continent. You can take classes in any language. You can eat at a restaurant with authentic food from any country in the world. Every subculture lives here; every opportunity for learning, entertainment, or community service exists here. And let us not forget to mention the mountains! 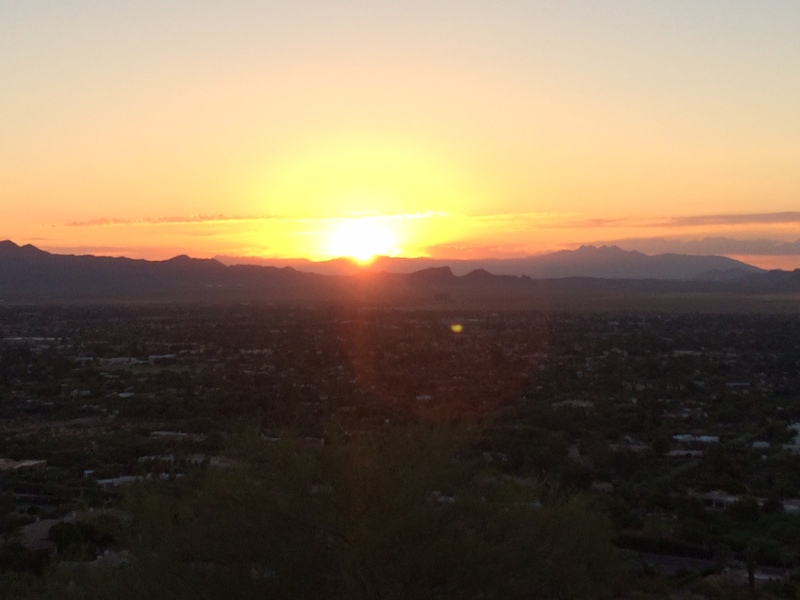 You have not experienced Phoenix until you have climbed our mountains. I read yesterday that Phoenix has the best urban hiking anywhere in the country. In the western Valley, you can hike Deem Hills, Thunderbird Mountain Park, or, if you don’t mind the drive, the White Tanks. In the East, the Superstition Mountains offer endless trails and hide the gem that is the Salt River. In the South, South Mountain rises high above the horizon. And central Phoenix, of course contains my personal favorites– Camelback, Piestewa, Shadow Mountain, Dreamy Draw, North Mountain, and the beautiful Phoenix Mountain Preserve trails. “Mount Wasabi” is a Phoenix Mountain Preserve peak that was just three-quarters of a mile from ACU and from our apartment. We spent a lot of time running and hiking there. Phoenix has a lot of indoor points of interest, too. The Science Center, the Musical Instrument Museum, the pro sports facilities, the art galleries, and so much more. And our sunsets! But I digress. I loved living in the country. I loved living in the suburbs, once I learned to. And when I moved to central Phoenix, I loved living there, too. And wherever we go from here, I’ll learn to love it there. No matter where you go, there is something wonderful about where you live. I encourage you, don’t let your location get you down. You’ll never be happy if you can’t learn to love where you live. Paul wrote in Philippians 4:13, “I can do all things through Christ who gives me strength.” He wasn’t taking about superpowers. He was talking about contentment. “Not that I am speaking of being in need, for I have learned in whatever situation I am in to be content. I know how to be brought low, and I know how to abound. In any and every circumstance, I have learned the secret of facing plenty and hunger, abundance and need. I can do all things through him who strengthens me” (Vs. 11-14). What is the secret of being content in whatever situation you are in? Allowing God to give you the strength to be OK with wherever you are. Spend time with Him daily in prayer and in your Bible. So if you’re struggling with where you live, don’t look behind you to where you used to be or pine for some future place. Instead, look around and find the beauty in your hometown and look above you to find your strength and contentment in the Lord.